← Wedding Bells: What Does Your Bouquet Mean? 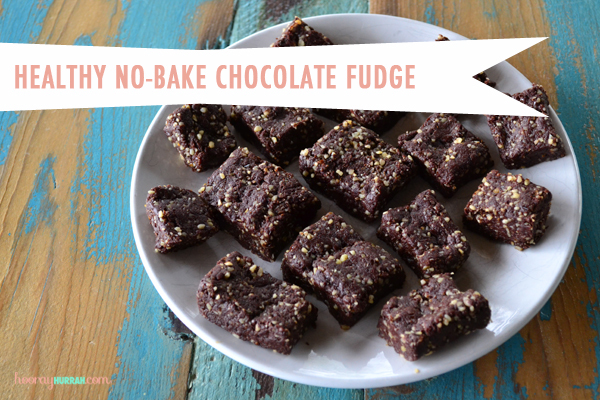 How’s this for a tasty little morsel to brighten up your Tuesday: Healthy, no-bake, four-ingredient fudge. (Really!) 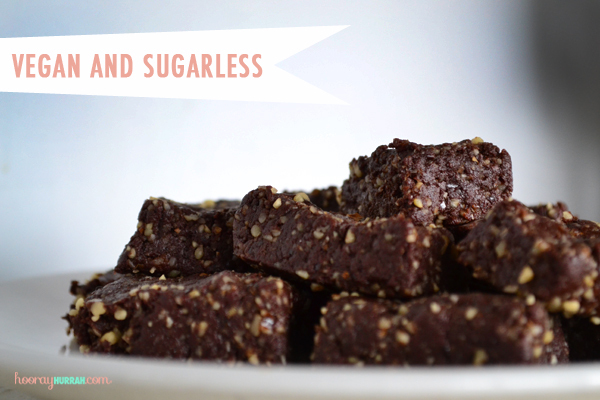 I’m not going to lie—especially if you’re trying to nix processed sugar from your diet like I am, this easy recipe is kinda life-changing. And don’t worry if you’re not super into dates or walnuts as separate entities. Mark thinks dates are downright gross by themselves and he’s a big, big, BIGGG fan of this fudge. 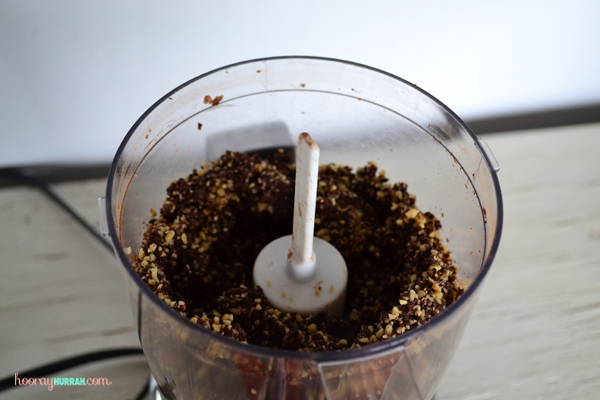 Combine all ingredients in a food processor and blend until crumbly. Transfer the crumbly mixture to a baking pan or cookie sheet, and press into a little rectangle of your desired thickness (you probably won’t fill the entire pan unless you’re working with a tiny one). 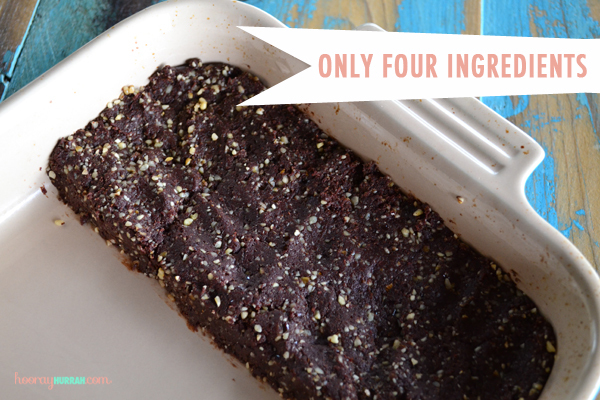 Cut into squares and enjoy immediately or store in the fridge for later. 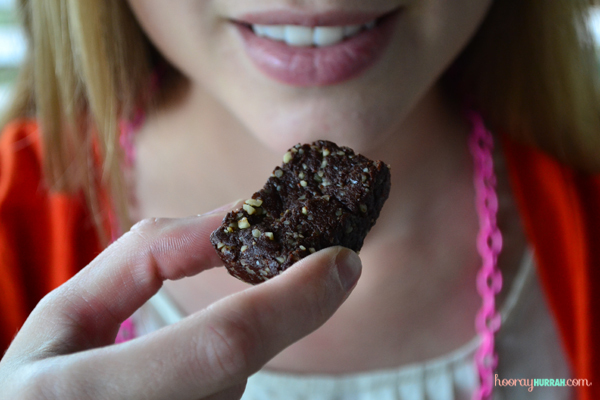 These little fudge squares are pretty irresistible and they even passed the kiddo taste test. (Mark’s little cousin Bennett went back for thirds.) I bet they’d be even better with a little cinnamon, a dash of chili powder or some shredded coconut added into the mix. P.S. My healthy chocolate chia seed pudding is pretty good, too. This entry was posted in Food + More, Kitchen Tidbit and tagged cacao, chocolate, dates, dessert, food, fudge, sugarless, treat, vegan, walnuts. Bookmark the permalink. These are so good even my picky 7 year old cousin liked them and couldn’t tell they weren’t traditional fudge squares. Because of the soft consistency I bet you could roll em into little balls or mold em into all sorts of silly shapes. Gonna try it next time. I just made this and it is AMAZING!! Everyone needs to make this right now! My two toddlers and my husband all loved it and kept begging me for more. Perfect guilt-free treat for the whole family. Thank you so much for the recipe!! So happy to hear you and your kiddos liked them! Pretty amazing that there’s no sugar involved, right?! Made these the other night and they were delicious, but I’m not sure what I did wrong cause mine were super crumbly. Like, they weren’t staying together at all. Too many walnuts? Cacao powder? They’re a little crumbly, but I find that if you roll them out very firmly they hold together pretty well. 🙂 Just make sure that your walnuts are processed very finely or maybe try using a little less next time. Let me know how it works! i loove looove loooove this recipe. instead of using vanilla essence (we were all out) i used a tbsp of almond milk delish!